Today marks my first post on a chicken recipe. This is no accident. I don’t like chicken. “How do you not like chicken?” I’ve been asked so many times, and then given a bazillion reasons why I should like it. It’s a blank canvas. It’s easy to cook. It’s healthy. It’s cheap. It’s America’s favorite meat. Oreos are America’s favorite cookie, and I don’t like them either. That’s just how I roll. 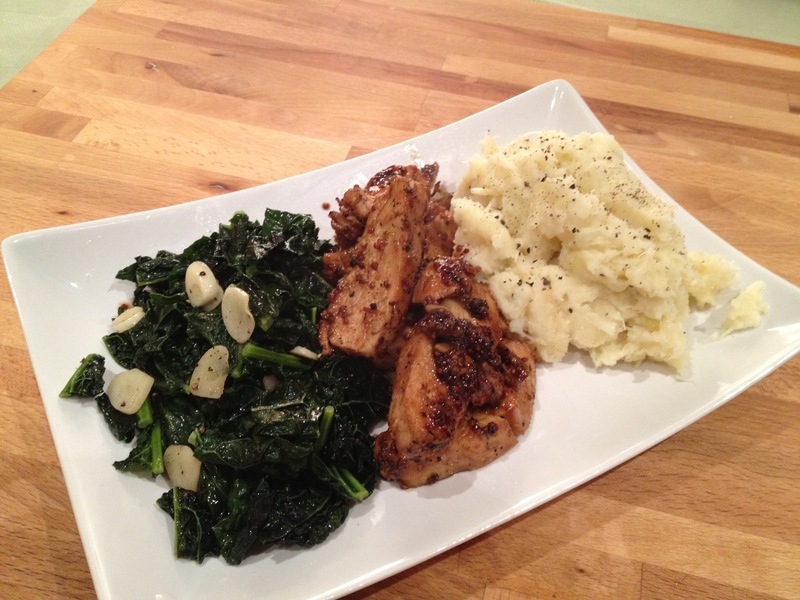 On the seldom occasions I do eat chicken it’s neither healthy nor easy to prepare. As you’ve probably noticed, most of my healthier recipes are veggie based—if I have to avoid my favorite meat (Steak! Steak! Steak! ), I’d rather avoid meat altogether. The idea of poached chicken makes me wince. Grilled chicken breasts tend to be dry. Roasted chicken, while tasty (especially when accompanied by mashed potatoes and buttered root veggies) just takes too long. Glazing, however, is easy, quick, healthy, and above all—delicious, and it’s changing my mind about chicken. I got the idea to make glazed chicken from this month’s issue of Cooking Light. I love Cooking Light (I’ve been a subscriber for four years), but I get annoyed with the magazine for publishing so many articles on chicken every issue. And at least three times a year, there’s a feature on 150 ways to revamp chicken breasts (I’m exaggerating, but it’s near 150). Reinventing the wheel—and reading about reinventing the wheel—is exhausting. But this time I’m not annoyed with Cooking Light. 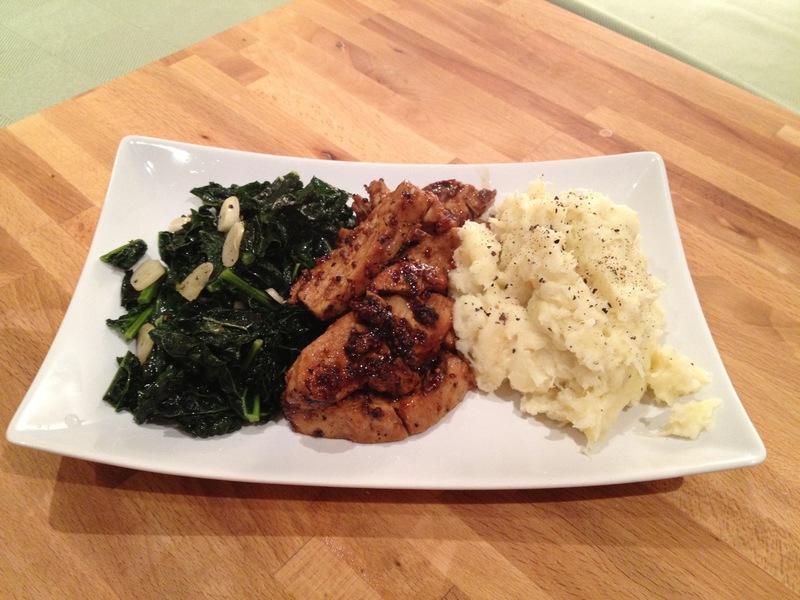 I’m down right thrilled with January’s chicken feature, if only for its guide to glazing chicken. The inspiration for this recipe was the Maple Mustard Glazed Chicken (page 130), but since I didn’t have most of the ingredients that were called for, I improvised. I call my recipe MHB Chicken, because the base of the glaze is whole grain mustard (as opposed to ground), honey, and balsamic vinegar. The technique is really simple and the dish is pretty quick to make. It’s also delicious and low in fat (yay). Joining the MHB chicken for dinner tonight were two of my new favorites: Tuscan kale and parsnips, vegetables I was introduced to earlier this month at a cooking class at Camaje Bistro. The class was a truly fantastic experience that I’d recommend to anyone living in New York or visiting town. Abby Hitchcock, chef and instructor, has a very creative yet practical approach to cooking, and knows how to maximize flavor without complicating the cooking process—truly, a gift. Tuscan kale, also known as Dinosaur kale, isn’t curly like regular kale, and its leave look sort of scaly. It should be blanched and drained before sautéing. I combined the parsnip with green apple and made what I call a smash—sort of a cross between a mash and a puree—that guarantees great texture & maximum flavor, using just a touch of butter and light cream. I love the Parsnip Apple Smash as an alternative to mashed potatoes, which I love, probably because I load mine up with cheese. Parsnips also offer a really unique flavor profile—kinda sweet, kinda spicy, a little nutty, a touch peppery—which is boosted even further by the addition of tart apple & a generous dash of salt and pepper. I hope you’ll make this meal, as I’m sure you’ll love it as much as I do. Start to finish, it takes about 45 minutes to prep and cook everything, and the only special cookware you’ll need is an oven-safe skillet. Fill a large pot with water and bring to a boil. Add kale, and cook about 4 minutes. Drain and set aside. (You can do this part the day before & refrigerate the kale). Once the pot has cooled, rinse and fill with water, this time adding a generous dash of salt, and set the heat to high. 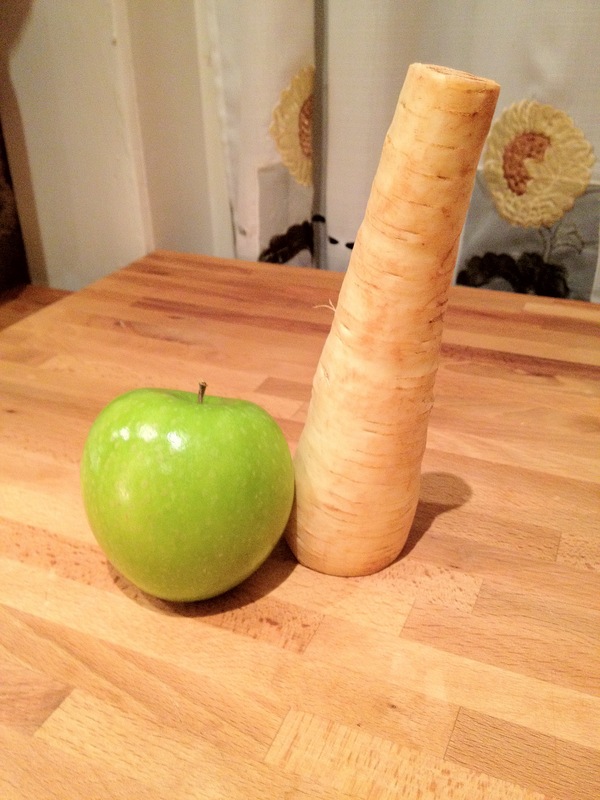 While you wait for the water to boil, peel the parsnips and cut into pieces, about 1 inch thick. Add the parsnips to boiling water, and set a timer for 8 minutes. In the meantime, peel and core the apple, then cut into 1 inch pieces. Preheat your oven to 400 degrees. Then prep your glaze for the chicken: combine the garlic, thyme, broth and honey in a small bowl. In a separate bowl, combine the mustard and balsamic vinegar. When the timer goes off, add the apple to boiling water and set the timer for 3 minutes. At the end of that time, turn off the heat and remove the apple and parsnip pieces with a slotted spoon and transfer to another dish. Carefully drain the water from the pot and put the parsnip and apple back in, then cover the pot and set it back on the stove. 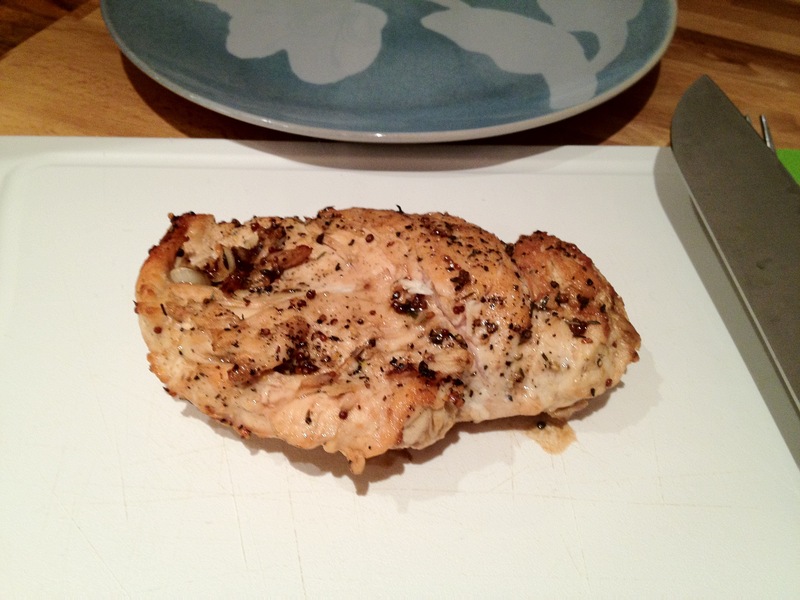 Sprinkle salt and pepper on both sides of the chicken breast. Set a medium-sized oven safe skillet on the stove over medium high heat. Once the pan is almost hot, add the oil and swirl to coat. Add chicken to the pan, and let it cook for 2-3 minutes on each side. Remove chicken from the pan. Add garlic broth mixture to the pan; it should sizzle just when it hits the surface. Cook for 2 minutes, stirring frequently. Add the mustard and vinegar mixture, continuing to stir and cook for another minute. Add the chicken back to the pan, then spoon the sauce over the top. Cook for about a minute, then turn off the heat and transfer the skillet carefully to the oven. Set timer for 10 minutes. 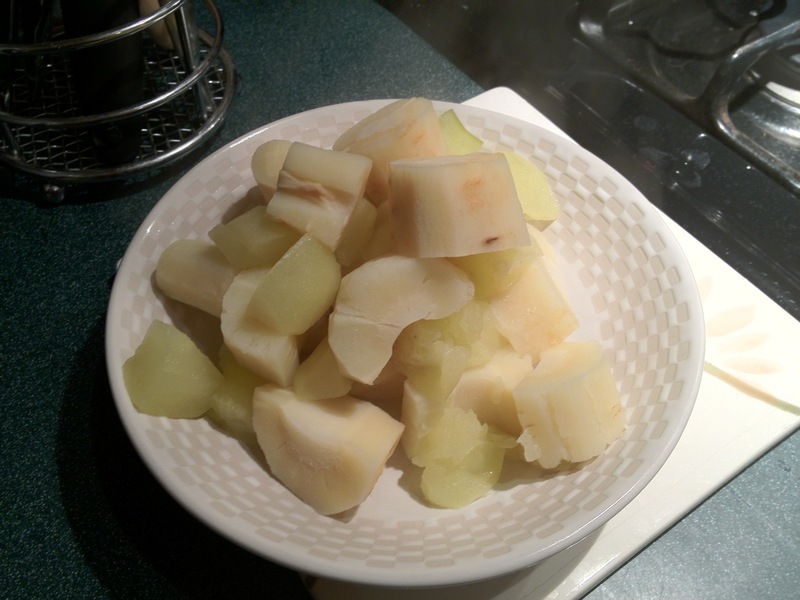 Turn the heat to medium under the pot of apple and parsnips. Add the butter and light cream. Using a fork or potato masher, gently smash the apples and parsnip into the butter and cream until all are just combined. Season with salt and pepper to your taste. Cover the pot and turn off the heat. Set a medium skillet over high heat, and once it’s almost hot add the oil for the kale. Swirl to coat. Add garlic, and cook for 1-2 minutes before adding the kale. (Since there will still be some moisture on the kale, the oil may sputter a bit upon adding, so stand back). Stir the kale so it’s covered with the garlic and oil. Turn the heat down to medium, and cook for 3-4 minutes, seasoning with salt to your taste. Turn off the heat and cover. When the timer goes off, carefully remove the skillet from the oven. Transfer chicken to a cutting board to rest. You’ll notice the pan sauce has reduced to a syrup—this is what you want—but if it’s too thick, add some more chicken broth and bring the mixture to a simmer on the stove. 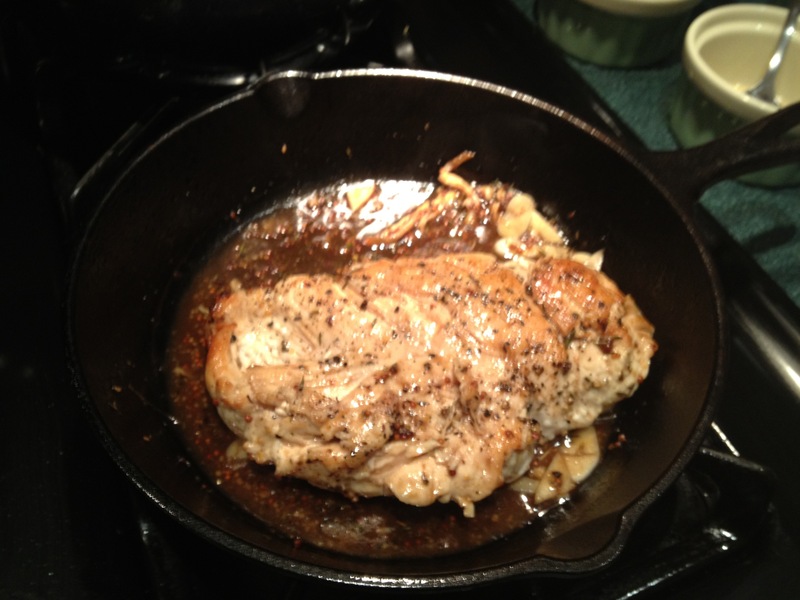 Once the chicken has rested 5 minutes, slice the breast meat diagonally and add that back to the skillet, gently tossing (or stirring) to coat with the sauce. Now you’re ready to serve. 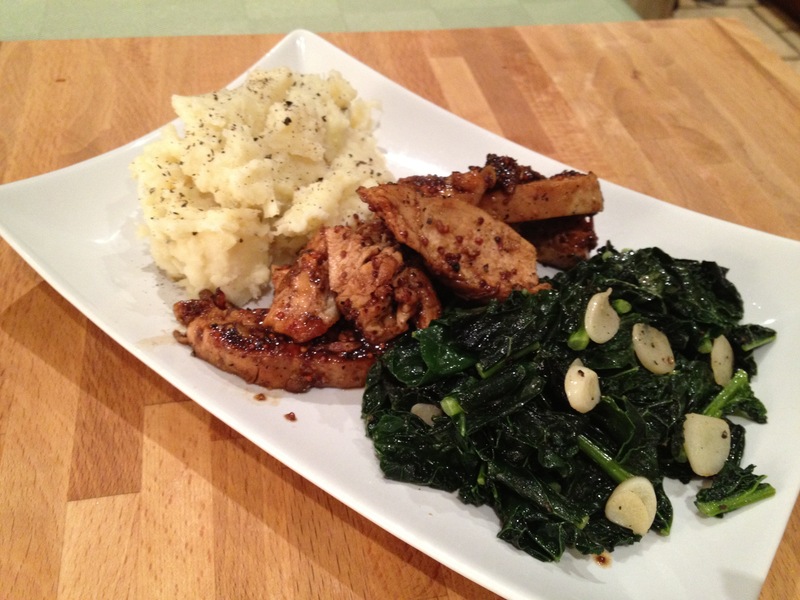 You could use the kale as a bed for the chicken, but I like to keep the sauces separate, so I served them alongside each other, then added the parsnip apple smash. 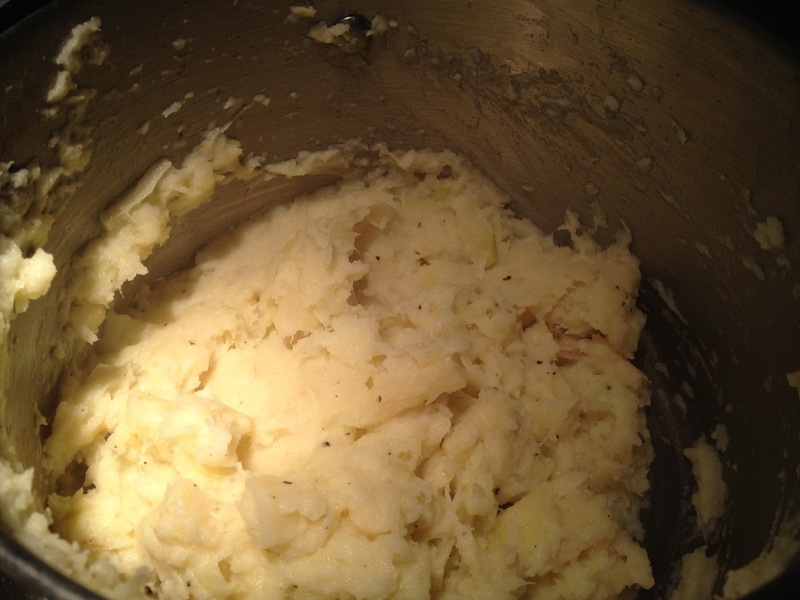 Finish with ground black pepper, and you’re set. All that’s left to do is eat. This entry was posted in Musings, Recipes, Savory and tagged abby hitchcock, apple, camaje, chicken, cooking light, dinner, easy, healthy, honey, light, mains, mustard, parsnip, quick, savory, tuscan cale. Bookmark the permalink.